"E-cash" redirects here. For the 20th century brand, see ecash. Digital currency (digital money, electronic money or electronic currency) is a type of currency available in digital form (in contrast to physical, such as banknotes and coins). It exhibits properties similar to physical currencies, but can allow for instantaneous transactions and borderless transfer-of-ownership. 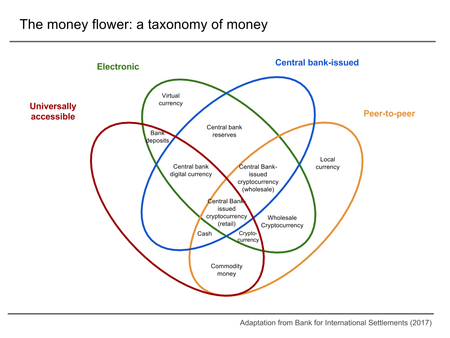 Examples include virtual currencies and cryptocurrencies and central bank issued money accounted for in a computer database (including digital base money). Like traditional money, these currencies may be used to buy physical goods and services, but may also be restricted to certain communities such as for use inside an online game or social network. Digital currency is a money balance recorded electronically on a stored-value card or other devices. Another form of electronic money is network money, allowing the transfer of value on computer networks, particularly the Internet. Electronic money is also a claim on a private bank or other financial institution such as bank deposits. In 1997, Coca-Cola offered buying from vending machines using mobile payments. After that PayPal emerged in 1998. Other systems followed suit, such as e-gold, but it faced issues because it was used by criminals and was closed by U.S Department of Justice in 2005. In 2008, bitcoin was introduced, which marked the start of digital currencies. Origins of digital currencies date back to the 1990s Dot-com bubble. One of the first was E-gold, founded in 1996 and backed by gold. Another known digital currency service was Liberty Reserve, founded in 2006; it lets users convert dollars or euros to Liberty Reserve Dollars or Euros, and exchange them freely with one another at a 1% fee. Both services were centralized, reputed to be used for money laundering, and inevitably shut down by the U.S. government. Q coins or QQ coins, were used as a type of commodity-based digital currency on Tencent QQ's messaging platform and emerged in early 2005. Q coins were so effective in China that they were said to have had a destabilizing effect on the Chinese Yuan currency due to speculation. Recent interest in cryptocurrencies has prompted renewed interest in digital currencies, with bitcoin, introduced in 2008, becoming the most widely used and accepted digital currency. According to the European Central Bank's 2015 "Virtual currency schemes – a further analysis" report, virtual currency is a digital representation of value, not issued by a central bank, credit institution or e-money institution, which, in some circumstances, can be used as an alternative to money. In the previous report of October 2012, the virtual currency was defined as a type of unregulated, digital money, which is issued and usually controlled by its developers, and used and accepted among the members of a specific virtual community. According to the Bank for International Settlements' November 2015 "Digital currencies" report, it is an asset represented in digital form and having some monetary characteristics. Digital currency can be denominated to a sovereign currency and issued by the issuer responsible to redeem digital money for cash. In that case, digital currency represents electronic money (e-money). Digital currency denominated in its own units of value or with decentralized or automatic issuance will be considered as a virtual currency. Most of the traditional money supply is bank money held on computers. This is also considered digital currency. One could argue that our increasingly cashless society means that all currencies are becoming digital, but they are not presented to us as such. Currency can be exchanged electronically using debit cards and credit cards using electronic funds transfer at point of sale. In January 2010, Venmo launched as a mobile payment system through SMS, which transformed into a social app where friends can pay each other for minor expenses like a cup of coffee, rent and paying your share of the restaurant bill when you forget your wallet. It is popular with college students, but has some security issues. It can be linked to your bank account, credit/debit card or have a loaded value to limit the amount of loss in case of a security breach. Credit cards and non-major debit cards incur a 3% processing fee. On September 19, 2011, Google Wallet released in the United States to make it easy to carry all your credit/debit cards on your phone. In 2012 Ireland's O2 (owned by Telefónica) launched Easytrip to pay road tolls which were charged to the mobile phone account or prepay credit. The UK's O2 invented O2 Wallet at about the same time. The wallet can be charged with regular bank accounts or cards and discharged by participating retailers using a technique known as 'money messages'. The service closed in 2014. On September 9, 2014, Apple Pay was announced at the iPhone 6 event. In October 2014 it was released as an update to work on iPhone 6 and Apple Watch. It is very similar to Google Wallet, but for Apple devices only. A cryptocurrency is a type of digital asset that relies on cryptography for chaining together digital signatures of asset transfers, peer-to-peer networking and decentralization. In some cases a proof-of-work or proof-of-stake scheme is used to create and manage the currency. Cryptocurrencies allow electronic money systems to be decentralized. The first and most popular system is bitcoin, a peer-to-peer electronic monetary system based on cryptography. On March 20, 2013, the Financial Crimes Enforcement Network issued a guidance to clarify how the U.S. Bank Secrecy Act applied to persons creating, exchanging, and transmitting virtual currencies. In July 2014, the New York State Department of Financial Services proposed the most comprehensive regulation of virtual currencies to date, commonly called BitLicense. Unlike the US federal regulators it has gathered input from bitcoin supporters and the financial industry through public hearings and a comment period until 21 October 2014 to customize the rules. The proposal per NY DFS press release “sought to strike an appropriate balance that helps protect consumers and root out illegal activity". It has been criticized by smaller companies to favor established institutions, and Chinese bitcoin exchanges have complained that the rules are "overly broad in its application outside the United States". The Netherlands' Chipknip: As an electronic cash system used in the Netherlands, all ATM cards issued by the Dutch banks had value that could be loaded via Chipknip loading stations. For people without a bank, pre-paid Chipknip cards could be purchased at various locations in the Netherlands. As of January 1, 2015, you can no longer pay with Chipknip. Belgium's Proton: An electronic purse application for debit cards in Belgium. Introduced in February 1995, as a means to replace cash for small transactions. The system was retired in December 31, 2014. In March 2018, the Marshall Islands became the first country to issue their own cryptocurrency and certify it as legal tender; the currency is called the "sovereign". A deputy governor at the central bank of China, Fan Yifei, wrote that "the conditions are ripe for digital currencies, which can reduce operating costs, increase efficiency and enable a wide range of new applications". According to Fan Yifei, the best way to take advantage of the situation is for central banks to take the lead, both in supervising private digital currencies and in developing digital legal tender of their own. The Danish government proposed getting rid of the obligation for selected retailers to accept payment in cash, moving the country closer to a "cashless" economy. The Danish Chamber of Commerce is backing the move. Nearly a third of the Danish population uses MobilePay, a smartphone application for transferring money. A law passed by the National Assembly of Ecuador gives the government permission to make payments in electronic currency and proposes the creation of a national digital currency. "Electronic money will stimulate the economy; it will be possible to attract more Ecuadorian citizens, especially those who do not have checking or savings accounts and credit cards alone. The electronic currency will be backed by the assets of the Central Bank of Ecuador", the National Assembly said in a statement. In December 2015, Sistema de Dinero Electrónico ("electronic money system") was launched, making Ecuador the first country with a state-run electronic payment system. Unified Payments Interface (UPI) is an instant real-time payment system developed by National Payments Corporation of India facilitating inter-bank transactions. The interface is regulated by the Reserve Bank of India and works by instantly transferring funds between two bank accounts on a mobile platform. UPI is built over Immediate Payment Service(IMPS) for transferring funds. Being a digital payment system it is available 24*7 and across public holidays. Unlike traditional mobile wallets, which takes a specified amount of money from user and stores it in its own accounts, UPI withdraws and deposits funds directly from the bank account whenever a transaction is requested. It uses Virtual Payment Address (a unique ID provided by the bank), Account Number with IFS Code, Mobile Number with MMID (Mobile Money Identifier), Aadhaar Number, or a one-time use Virtual ID. An UPI-PIN (UPI Personal Identification number that one creates on the UPI app of the bank) is required to confirm each payment. Government-controlled Sberbank of Russia owns Yandex.Money – electronic payment service and digital currency of the same name. Russia’s President Vladimir Putin has signed off on regulation of ICOs and cryptocurrency mining by July 2018. South Korea plans national digital currency using a Blockchain. The chairman of South Korea’s Financial Services Commission (FSC), Yim Jong-yong, announced that his department will "Lay the systemic groundwork for the spread of digital currency." South Korea has already announced plans to discontinue coins by the year 2020. Sweden is in the process of replacing all of its physical banknotes, and most of its coins by mid-2017. However, the new banknotes and coins of the Swedish krona will probably be circulating at about half the 2007 peak of 12,494 kronor per capita. The Riksbank is planning to begin discussions of an electronic currency issued by the central bank to which "is not to replace cash, but to act as complement to it". Deputy Governor Cecilia Skingsley states that cash will continue to spiral out of use in Sweden, and while it is currently fairly easy to get cash in Sweden, it is often very difficult to deposit it into bank accounts, especially in rural areas. No decision has been currently made about the decision to create "e-krona". In her speech, Skingsley states: "The first question is whether e-krona should be booked in accounts or whether the ekrona should be some form of a digitally transferable unit that does not need an underlying account structure, roughly like cash." Skingsley also states: "Another important question is whether the Riksbank should issue e-krona directly to the general public or go via the banks, as we do now with banknotes and coins." Other questions will be addressed like interest rates, should they be positive, negative, or zero? In 2016, a city government first accepted digital currency in payment of city fees. Zug, Switzerland, added bitcoin as a means of paying small amounts, up to 200 SFr., in a test and an attempt to advance Zug as a region that is advancing future technologies. In order to reduce risk, Zug immediately converts any bitcoin received into the Swiss currency.Swiss Federal Railways, government-owned railway company of Switzerland, sells bitcoins at its ticket machines. The chief economist of Bank of England, the central bank of the United Kingdom, proposed abolition of paper currency. The Bank has also taken an interest in bitcoin. In 2016 it has embarked on a multi-year research programme to explore the implications of a central bank issued digital currency. The Bank of England has produced several research papers on the topic. One suggests that the economic benefits of issuing a digital currency on a distributed ledger could add as much as 3 percent to a country's economic output. The Bank said that it wanted the next version of the bank’s basic software infrastructure to be compatible with distributed ledgers. The National Bank of Ukraine is considering a creation of its own issuance/turnover/servicing system for a blockchain-based national cryptocurrency. The regulator also announced that blockchain could be a part of a national project called "Cashless Economy". Government attitude dictates the tendency among established heavy financial actors that both are risk-averse and conservative. None of these offered services around cryptocurrencies and much of the criticism came from them. The first mover among these has been Fidelity Investments, Boston based Fidelity Digital Assets LLC will provide enterprise-grade custody solutions, a cryptocurrency trading execution platform and institutional advising services 24 hours a day, seven days a week designed to align with blockchain's always-on trading cycle". It will work with Bitcoin and Ethereum with general availability scheduled for 2019. Hard electronic currency does not have the ability to be disputed or reversed when used. It is nearly impossible to reverse a transaction, justified or not. It is very similar to cash. Advantages of this system include it being cheaper to operate, and transactions are instantaneous. Western Union, KlickEx and Bitcoin are examples of this type of currency. Soft electronic currencies are the opposite of hard electronic currencies. Payments can be reversed. Usually, when a payment is reversed there is a "clearing time." This can take 72 hours or more. Examples of soft currencies are PayPal and any type of credit card. A hard currency can be "softened" with a third party service. Many existing digital currencies have not yet seen widespread usage, and may not be easily used or exchanged. Banks generally do not accept or offer services for them. There are concerns that cryptocurrencies are extremely risky due to their very high volatility and potential for pump and dump schemes. Regulators in several countries have warned against their use and some have taken concrete regulatory measures to dissuade users. The non-cryptocurrencies are all centralized. As such, they may be shut down or seized by a government at any time. The more anonymous a currency is, the more attractive it is to criminals, regardless of the intentions of its creators. Forbes writer Tim Worstall has written that the value of bitcoin is largely derived from speculative trading. Bitcoin has also been criticised for its energy inefficient SHA-256-based proof of work. ^ "Digital vs. Virtual Currencies". Andrew Wagner. Retrieved 1 December 2014. ^ "Digital currencies are impacting video games with..." Offgamers. Retrieved 6 November 2018. ^ "What is bitcoin?". CoinDesk. Retrieved 24 January 2014. ^ Chaum, David (1982). "Blind signatures for untraceable payments" (PDF). Department of Computer Science, University of California, Santa Barbara, CA. ^ a b c Griffith, Ken (16 April 2014). "A Quick History of Cryptocurrencies BBTC — Before Bitcoin". Bitcoin Magazine. Retrieved 18 April 2015. ^ "Digicash files Chapter 11". ^ "Requiem for a Bright Idea". ^ "History of Mobile & Contactless Payment Systems". ^ "Digital vs Virtual currencies". ^ Foley, Stephen (28 November 2013). "E-gold founder backs new Bitcoin rival". Financial Times. Retrieved 11 May 2018. ^ Jack Cloherty (28 May 2013). "'Black Market Bank' Accused of Laundering $6B in Criminal Proceeds". ABC News. Retrieved 28 May 2013. ^ "'China's virtual currency threatens the Yuan'". Asia Times Online. 5 December 2006. Retrieved 14 May 2016. ^ "Virtual currency schemes - a further analysis" (PDF). ecb.europa.eu. February 2015. Retrieved 1 February 2018. ^ a b "Virtual Currency Schemes" (PDF). ecb.europa.eu. October 2012. Retrieved 1 February 2018. ^ "Digital Currencies" (PDF). bis.org. November 2015. Retrieved 1 February 2018. ^ "1". Virtual Currency Schemes (PDF). Frankfurt am Main: European Central Bank. October 2012. p. 5. ISBN 978-92-899-0862-7. Archived (PDF) from the original on 6 November 2012. ^ "Mobipay - Fujitsu Spain". ^ "Origins of Venmo". Retrieved 23 April 2015. ^ "Venmo Money, Venmo Problems". ^ "This Day in Tech: Google Wallet launches". 19 September 2011. ^ "Easytrip, O2 launch mobile toll payments service in the Republic of Ireland". ^ "O2 - O2 money - The O2 Wallet service closed on 31st March 2014". ^ "Apple Watch works with Apple Pay to replace your credit cards". 9 September 2014. ^ Liu, Alec. "Beyond Bitcoin: A Guide to the Most Promising Cryptocurrencies". Vice Motherboard. Archived from the original on 24 December 2013. Retrieved 7 January 2014. ^ "Audit Report" (PDF). Treasury.gov. 10 November 2015. Retrieved 1 February 2018. ^ "Directive 2009/110/EC of the European Parliament and of the Council of 16 September 2009 on the taking up, pursuit and prudential supervision of the business of electronic money institutions amending Directives 2005/60/EC and 2006/48/EC and repealing Directive 2000/46/EC, Official Journal L 267, 10/10/2009 P. 0007 - 0017". Retrieved 30 December 2013. ^ "ELECTRONIC FUND TRANSFER ACT (REGULATION E)" (PDF). Federal Deposit Insurance Corporation. ^ "In Introduction to Electronic Money Issues - Appendixes" (PDF). ^ "FIN-2013-G001: Application of FinCEN's Regulations to Persons Administering, Exchanging, or Using Virtual Currencies". Financial Crimes Enforcement Network. 18 March 2013. p. 6. Archived from the original on 19 March 2013. Retrieved 29 May 2015. ^ Bobelian, Michael (9 May 2014). "SEC Warns Investors To Beware Of Bitcoin". Forbes. Retrieved 2 October 2014. ^ Bobelian, Michael (25 July 2014). "New York's Financial Regulator, Benjamin Lawsky, Maintains Lead On Bitcoin Regulation". Forbes. Retrieved 3 October 2014. ^ SydneyEmber (21 August 2014). "More Comments Invited for Proposed Bitcoin Rule". DealBook. NY Times. Retrieved 3 October 2014. ^ a b "BoE explores implications of blockchain and central bank-issued digital currency". EconoTimes.com. 9 September 2016. Retrieved 5 January 2017. ^ "Hong Kong Octopus Card" (PDF). 2005. ^ ""Contactless" convenience with Sony's FeliCa". ^ "Proton". Archived from the original on 18 April 2015. ^ "Marshall Islands to issue own sovereign cryptocurrency". Reuters. Retrieved 5 March 2018. ^ "Celent calls on central banks to issue their own digital currencies /Euromoney magazine". Euromoney.com. 20 October 2016. Retrieved 5 January 2017. ^ a b c d e f g "Central Banks Consider Bitcoin's Technology, if Not Bitcoin". The New York Times. Retrieved 5 January 2017. ^ "On Digital Currencies, Central Banks Should Lead - Bloomberg View". Bloomberg. Retrieved 5 January 2017. ^ a b "Denmark proposes cash-free shops to cut retail costs". Reuters. 6 May 2015. Retrieved 5 January 2017. ^ "Cashless society: Denmark to allow shops to ban paper money". Fortune.com. Retrieved 5 January 2017. ^ "Ecuador to Create Government-Run Digital Currency as It Bans Bitcoin". Ibtimes.co.uk. 25 July 2014. Retrieved 5 January 2017. ^ Everett Rosenfeld (9 February 2015). "Ecuador becomes the first country to roll out its own digital durrency". Cnbc.com. Retrieved 5 January 2017. ^ "German Central Bank testing blockchain technology". Brave New Coin. 1 December 2016. Retrieved 5 January 2017. ^ "Deutsche Börse Group - Joint Deutsche Bundesbank and Deutsche Börse blockchain prototype". Deutsche-boerse.com. 28 November 2016. Retrieved 5 January 2017. ^ Antony Peyton. "Blockchain goes Dutch » Banking Technology". Bankingtech.com. Retrieved 5 January 2017. ^ Andrii Degeler (19 December 2012). "Yandex Sells 75% Of Yandex.Money To Sberbank For $60M". Thenextweb.com. Retrieved 5 January 2017. ^ "Putin Confirms Russia Will Regulate ICOs, Mining By July 2018". Cointelegraph. 24 October 2017. Retrieved 20 December 2017. ^ a b "South Korea plans national digital currency using a Blockchain". Brave New Coin. 26 October 2016. Retrieved 5 January 2017. ^ CNBC. "Currencies". CNBC. Retrieved 19 November 2017. ^ Riksbanken. "Skingsley: Should the Riksbank issue e-krona?". www.riksbank.se. Archived from the original on 21 December 2016. Retrieved 19 November 2017. ^ Uhlig/jse, Christian (1 July 2016). "Alpine 'Crypto Valley' pays with Bitcoins". DW Finance. Archived from the original on 20 September 2016. Retrieved 20 September 2016. ^ a b "SBB: Make quick and easy purchases with Bitcoin". Sbb.ch. Retrieved 5 January 2017. ^ "Government urged to use Bitcoin-style digital ledgers". Bbc.co.uk. Retrieved 5 January 2017. ^ Szu Ping Chan (13 September 2016). "Inside the Bank of England's vaults: can cash survive?". Telegraph.co.uk. Retrieved 5 January 2017. ^ a b "Cashless Ukraine: The National Bank Considers Blockchain Technology". ForkLog.net. 19 October 2016. Retrieved 5 January 2017. ^ a b Wikoff, Shawn (13 September 2016). "The expert Shawn Wikoff talks about Electronic money". Medium. Retrieved 28 January 2018. ^ Sidel, Robin (22 December 2013). "Banks Mostly Avoid Providing Bitcoin Services". Retrieved 19 November 2017 – via www.wsj.com. ^ Tucker, Toph. "Bitcoin's Volatility Problem: Why Today's Selloff Won't Be the Last". Bloomberg BusinessWeek. Bloomberg. Retrieved 6 April 2014. ^ O'Grady, Jason D. "A crypto-currency primer: Bitcoin vs. Litecoin". ZDNet. Retrieved 6 April 2014. ^ Frances Schwartzkopff; Peter Levring (18 December 2013). Bitcoins Spark Regulatory Crackdown as Denmark Drafts Rules. Bloomberg. Retrieved 6 April 2014. ^ a b Zetter, Kim (9 June 2009). "Bullion and Bandits: The Improbable Rise and Fall of E-Gold". Wired. Retrieved 6 April 2014. ^ Worstall, Tim. "Bitcoin Is More Like A Speculative Investment Than A Currency". Forbes. Retrieved 24 January 2014. ^ Lee, David; Kuo Chuen (2015). Handbook of Digital Currency: Bitcoin, Innovation, Financial Instruments, and Big Data. Academic Press. p. 211. ISBN 9780128023518. Retrieved 19 January 2017. Wikimedia Commons has media related to Digital currency. "What is Bitcoin?". CoinDesk. A generalized introduction and Q&A regarding the most widely used digital currency: Bitcoin. Chamber of Digital Commerce The Digital Chamber is an authoritative representative for the digital commerce industry in Washington, promoting the acceptance and use of digital assets. Digital Currency Council Training, certification & support for lawyers, accountants, and financial professionals in the digital currency economy.